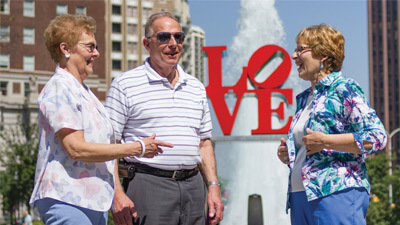 The Masonic Village at Warminster is conveniently located in suburban Philadelphia, close to many attractions and amenities, while being safely nestled in a quiet bedroom community. Residents enjoy a variety of leisure activities including community outings, lifelong learning opportunities, picnics, religious services, creative arts and games. Engage in stretching and yoga, or enjoy a visit from young students or friendly animals. Staff share their own hobbies and bring their travels to life with themed parties. An outdoor walking path encourages a daily dose of sunshine. Our campus is a full-service community unto itself including a gift shop, assembly room, courtyards, chapel, salon and more. The Masonic Village at Warminster is moments away from renowned shopping, arts, cultural and athletic venues. For those interested in exploring the city, Warminster is just 50 minutes away from Center City.